Built 1829 by converting the former "Spitalskirche" church. Closed 1904 due to safety concerns. Later used as military barracks, as a bank building and as an office building. Currently used as "Kundenzentrum" by "E-Werk Wels". 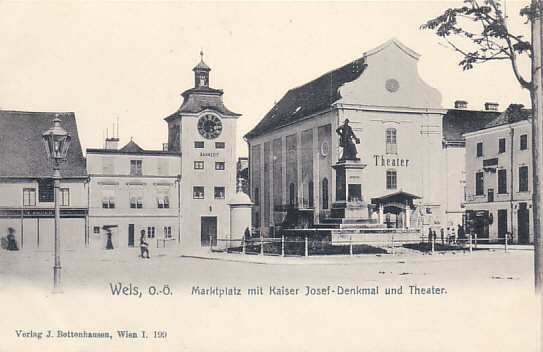 Front Text: "Wels, O.-Ö., Marktplatz mit Kaiser Josef-Denkmal und Theater"; inscription on clock tower: "Bahnzeit" [railway time], on monument: "Josef II. ", on the theatre building (behind the monument): "Theater"